¿Cómo terminó Alma Sofia Esperanza José Pura Candela con un nombre tan largo? Mientras Papi le cuenta la historia de cada uno de sus nombres, Alma comienza a sentir cómo cabe perfectamente en ellos. What’s in a name? For one little girl, her very long name tells the vibrant story of where she came from — and who she may one day be. Spanish language edition! If you ask her, Alma Sofia Esperanza José Pura Candela has way too many names: six! Just think of how hard it is to fit them all on the back of a little photo. How did such a small person wind up with such a large name? 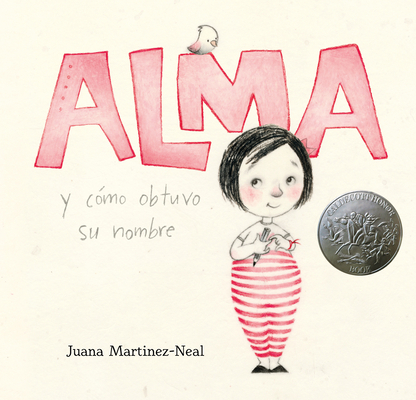 Alma turns to Daddy for an answer and learns of Sofia, the grandmother who loved books and flowers; Esperanza, the great-grandmother who longed to travel; José, the grandfather who was an artist; and other namesakes too. As she hears the story of her name, Alma starts to think it might be a perfect fit after all — and realizes that she will one day have her own story to tell. In her author-illustrator debut, Juana Martinez-Neal opens a treasure box of discovery for children who may be curious about their own origin or name story. Juana Martinez-Neal is the daughter and granddaughter of painters. She started her story in Lima, Peru, and then moved to the United States. The winner of a 2018 Pura Belpré Illustrator Award for La Princesa and the Pea by Susan Middleton Elya, Juana Martinez-Neal is still writing the story of her life, with the help of her husband and three children, in Arizona.